Would you like to escape exam outlines for a few minutes and focus on the wider world? Here's something brand new from scientists at Purdue University. Vulcan is a web site of interactive high-resolution maps with zoom features, tracking carbon emissions in the U.S. in greater detail than ever before. Greenhouse gas emissions are shown by county, down to individual factories. Based on statistics collected from government agencies during 2002 and supported by NASA and the Department of Energy, the Vulcan Project presents a fascinating glimpse of local and national air pollution. Vulcan also shows that the highest emissions levels are not always where everyone thought. Don't miss the video of the Vulcan product transported through the earth's atmosphere. Purdue's press release has more about Vulcan. In this presidential election season, knowing the facts and knowing whether the candidates get them right matter. For help in making those judgments and keeping those politicians accountable, go to FactCheck.org . This site monitors the factual accuracy of what is said by major U.S. political players in the form of TV ads, debates, speeches, interviews, and news releases. GovEngine is a Web portal for uncovering information about federal, state, and local government. Links on the sidebar to the right lead to pages on each of these subjects. There is also a map of the U.S.A., where one can click a state and then go to a page that contains links to the state's home page and constitution. In addition, there are lists of Web pages that contain further links to sources dealing with the executive, legislative, and judicial branches of the state in question. If you are interested in art law, take a look at the art law blog. This frequently updated blog discusses current events in the art law world. Besides offering loads of information on art law, the blog also gives insight into the fascinating world of art collectors, dealers, museums and artists. Students experience the demands of law school, but how to learn what to expect in the practice of law? The New York State Bar Association. Special Committee on Balanced Lives in the Law recently released the long awaited Final Report. The bad news is that for many attorneys it is difficult to find and achieve a work / life balance. The good news is that there are steps that can be taken to help cope with the demands. Time and stress management skills are essential and can be learned. Law firms are aware of these issues and interested because they want to retain their young attorneys. Don't be taken by surprise. Law is a demanding profession but the attorneys interviewed for the report overwhelming said that they like practicing law and would do it again. Plan ahead so you can say the same. Wham! Pow! Zoom! A Superhero Registration Act? Exam period is near. Take a study break to consider the legal issues that arise in Marvel Universe when Capital Hill proposes that all costumed heroes unmask themselves before the government! 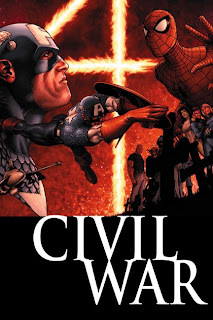 In Civil war: a Marvel Comics event, superheroes clash with one other as they struggle towards a decision that will change the Marvel Universe ... forever! Civil war is located in the library's reserve collection, ask for it at the the circulation desk. Some federal agencies seem to be putting a number of their documents on www.scribd.com. These are not easily browsable, so you should only use this site if you have some information on what you are looking for, but there may be documents here that do not appear on agency websites. It looks like some heavy users are the DOJ, the Treasury, and the EPA (the EPA has uploaded over 300,000 documents). To find a particular agency’s documents search for a user with its title (the users for those three agencies are DOJ, Treasury, and EPA). Because Scribd actually scans and uploads paper documents for free, this may become a source for many materials like this.